@fawnpnguyen whoa. Need to try and make this. 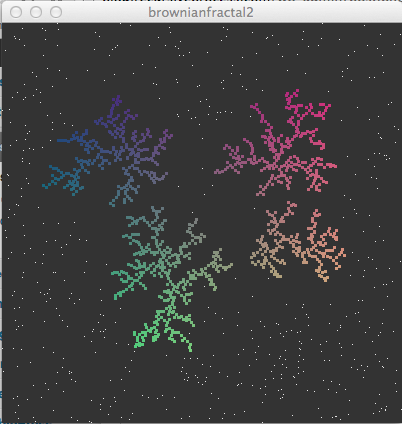 I started off and used VPython to create the fractal, but it was slow and buggy. Here’s a movie of my first attempt. When you click you create a new “seed” for the fractal to start. So I rewrote it in Processing.org (2.0 just came out! ), and the results are far more satisfying. Left click to start a seed, and right click to clear the scene. Check it out!